Clemson University is ranked among the top 25 national public universities in the country by U.S. News & World Report for the 11th year in a row. Clemson is No. 24 in the 2019 edition of Best Colleges Rankings released Monday. Karen Chapman of Atlanta, whose philanthropy has touched many lives through her support of education and health care, was named an honorary Clemson University alumna Monday. She was honored at the University Convocation, where her husband, Tom, was guest speaker as Clemson opened its 125th academic year. Private gifts to Clemson University and IPTAY in the fiscal year ending June 30 set annual fundraising records for another year. This is the seventh consecutive year that annual fundraising at Clemson has exceeded $100 million and the second straight year it topped $150 million. Clemson University’s board of trustees is pleased with the findings of an audit by the state’s Office of the Inspector General of the university’s board of trustees’ expenses, and welcomes its conclusions and recommendations. Private gifts to Clemson University and IPTAY in the fiscal year ending June 30 set annual fundraising records for the university. The unprecedented $151.3 million raised this year includes $100.1 million in cash gifts, pledges and gifts-in-kind; $11.5 million in planned gifts; and $39.7 million raised by IPTAY through its annual fund to support athletics. Clemson’s second-annual Give Day contributed more than $2 million from 3,265 donors. The Council for Advancement and Support of Education (CASE) District III recognized the work of Clemson University staff members with awards for their outstanding achievements in media, design and communications in 2016 at its recent annual awards ceremony in Nashville. On Friday, Clemson University will hold a ribbon-cutting ceremony to open its brand new $21.5 million Zucker Family Graduate Education Center, a 70,000-square-foot, state-of-the-art facility that will help shape the future of the state’s engineering landscape for generations to come. Planar, a Leyard company and global leader in display and digital signage technology, has become the first Sustaining Innovation Partner for Clemson University’s Watt Family Innovation Center with a gift-in-kind of more than $1 million worth of cutting-edge display technology. JoVanna King of Anderson has been named an honorary alumna of Clemson University. David and Lynette Snow of Darien, Connecticut, will match up to $1 million in funds raised through Clemson University’s student affairs advancement staff to complete the intramural field complex on Hartwell Lake. This latest pledge is in addition to the $2.4 million the Snows gave to this project in 2014. In less than two years, what began simply as an informational presentation about the ClemsonLIFE program to the university’s Board of Visitors has evolved into a grant-in-aid endowment to assist student participants and a supporting $100,000 gift from Clemson President James P. Clements and his wife, Beth. 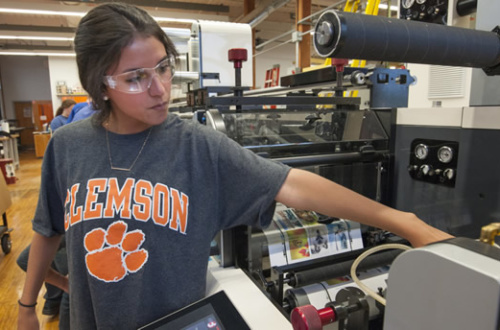 Clemson University’s nationally recognized graphic communications program just got better, thanks to a nearly $1 million gift-in-kind from one of the world’s leading manufacturers of dynamic printing solutions and technologies. Melvin K. and Dollie Younts, passionate Clemson fans and philanthropists of Fountain Inn, pledged the sixth Cornerstone Gift to athletics. The recently renovated 600-seat South Club area at Memorial Stadium will now be named the Melvin and Dollie Younts South Club in appreciation of their $2.5 million commitment. Clemson University’s 10-year capital campaign, “The Will to Lead,” has surpassed its billion-dollar goal with a total of $1,062,528,346 as of June 30. Clemson President James P. Clements declared it the most successful capital campaign in the university’s history and the largest goal ever achieved by a public university with an alumni base less than 150,000. Michael Nieri, who received his degree in construction management in Clemson’s College of Architecture in 1986, has pledged the fifth Cornerstone Gift to Clemson Athletics. His gift of $2.5 million will go to the development of a new student-athlete academic and life skills enrichment area in the Memorial Stadium WestZone.